Astialakwa is perhaps the most interesting of all the Jemez ruin sites, for profoundly sad reasons. It was the location of the Battle of Astialakwa, fought on July 24, 1694. And it was a very, very bad day for the Jemez Indians. I’ll briefly summarize the events of the battle, but for an outstanding, more complete account see “The Battle of Astialakwa” by Matt Liebmann, published in September 2010 in the SAA Archaeological Record. It can be found online in a number of places, or you may simply click here for a pdf version of it. 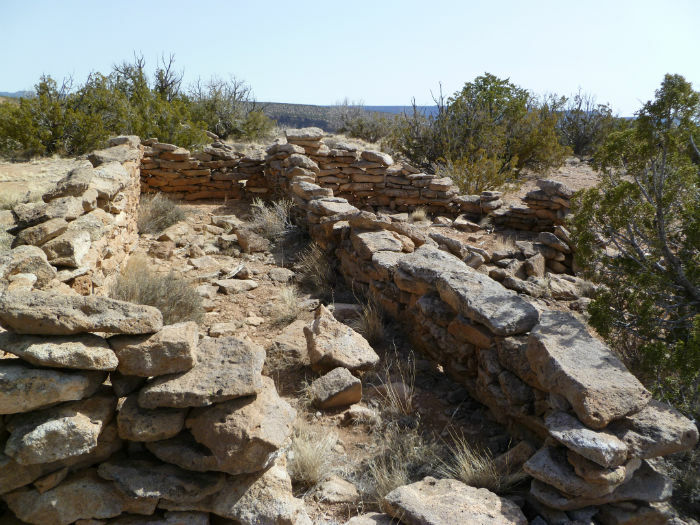 The Jemez were sort of the bad-asses of the Pueblo tribes, and took very little crap from anyone. They were especially belligerent with the Spanish, who had oozed into the area after running out of plunder possibilities in Mexico. 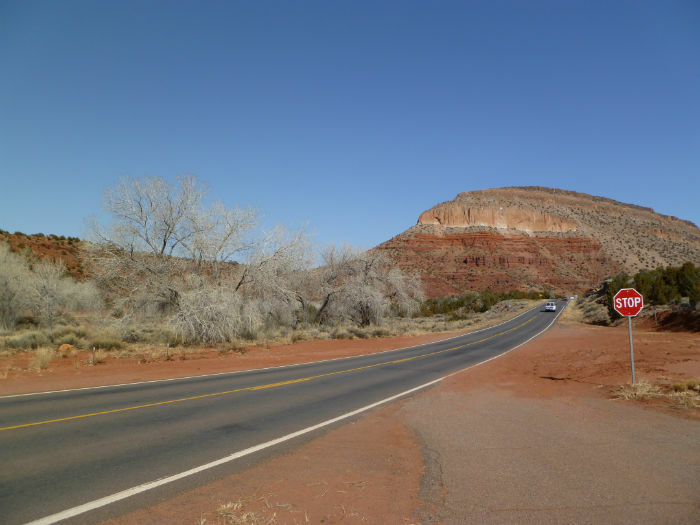 The Jemez were instrumental in the Pueblo Revolt of 1680, when the Pueblo tribes rose up and chased the Spanish back south across the Rio Grande. This was not to last however. In 1692 Diego de Vargas returned north into New Mexico with an armed force to retake what was theirs (in their eyes anyway, the Pueblo Indians had a different opinion). However the Spanish had learned considerable diplomacy in the 12 years they were booted out of the area, and softened their approach with the locals. The result was that many of the tribes tolerated, if not welcomed, the return of the Spanish. Not so the Jemez. From their strongholds high on mesas they fought back against not only the Spanish, but also the tribes supporting them. Finally Vargas had enough and planned an attack against the Jemez. The Jemez knew this was coming, and hastily consolidated their position to the top of Guadalupe Mesa, a thousand feet above the Jemez River. This mesa is surrounded primarily by cliff faces with only a few routes up, which the Jemez felt they could defend. They were wrong. 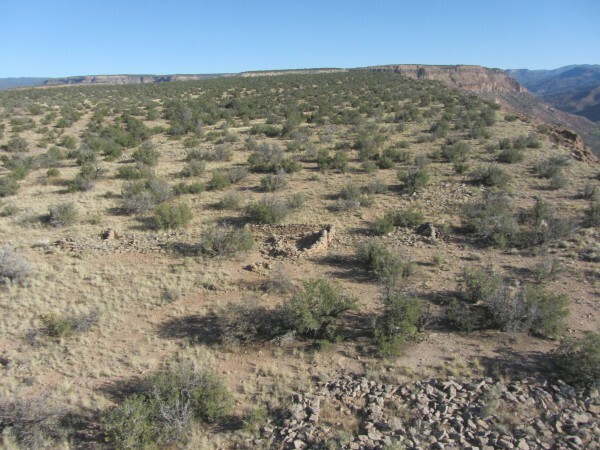 Vargas, with help from Indians of the Zia, Santa Ana and San Felipe Pueblos, attacked the Jemez’s mesa from two points on July 24, 1694. 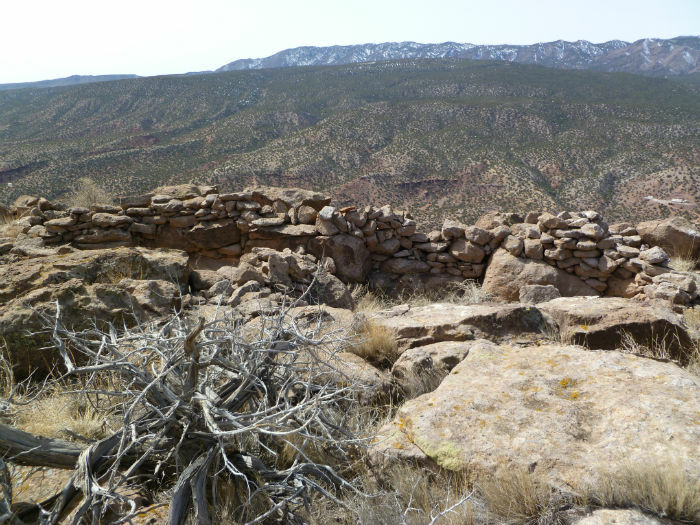 While the Jemez could shower down rocks and arrows on the invaders, eventually they proved no match for Spanish armor and harquebus (an early musket). By the end of day, the mesa top had been taken. 361 Jemez were taken prisoner, 84 were killed, including a number of warriors who threw themselves off the cliffs rather than be captured. 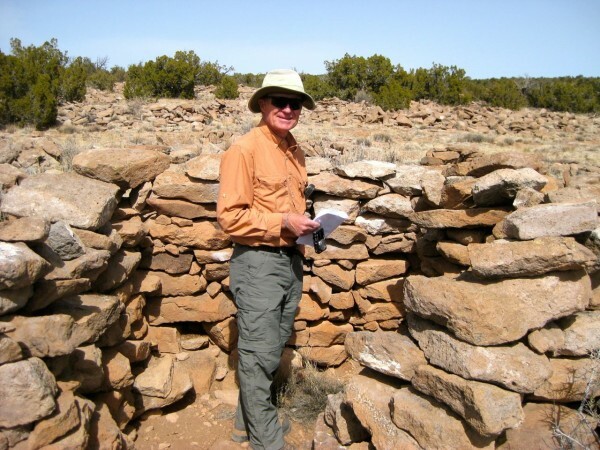 The stockpiled food of the Jemez was divided as spoils among the other pueblo tribes assisting the Spanish and the Jemez structures burned. At this point the pueblo was abandoned, never to be resettled. I had been past Guadalupe Mesa several times and access to the top looked highly questionable. Looking at Google Earth, I found what appeared to be a trail on its southwest face. I loaded it into my GPS and used it as a guide. 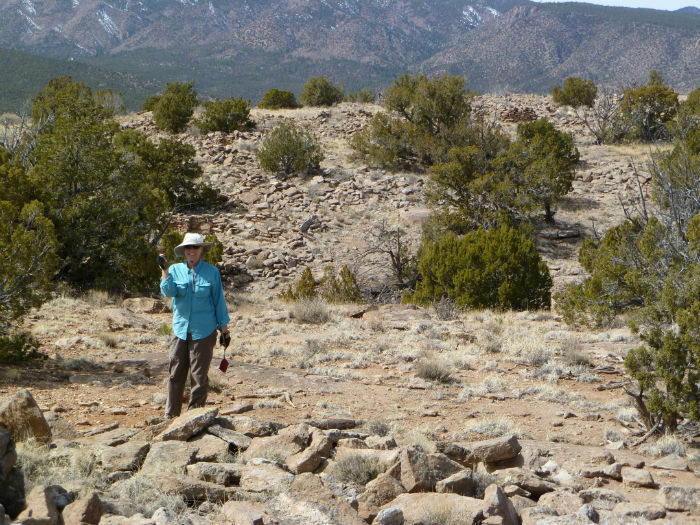 However it turned out there was a faint use trail marked with rock cairns. It could have very well been the route the Spanish used in their attack. 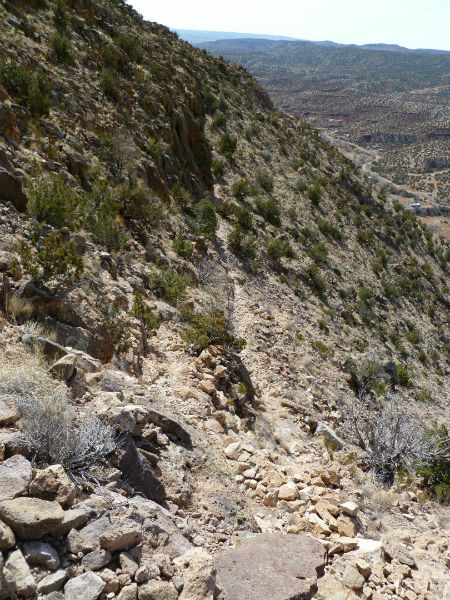 Yeah, that little line is the trail, and this is only part way up! After a lot of slogging (and avoiding looking down!) 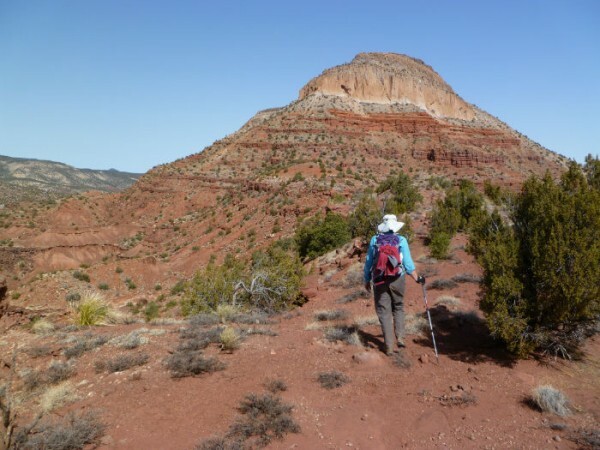 we reached the top and headed to the southerly point of the mesa. There was a superb view to the south past Patokwa, the existing Jemez Pueblo and all the way to the Sandia Mountains above Albuquerque. 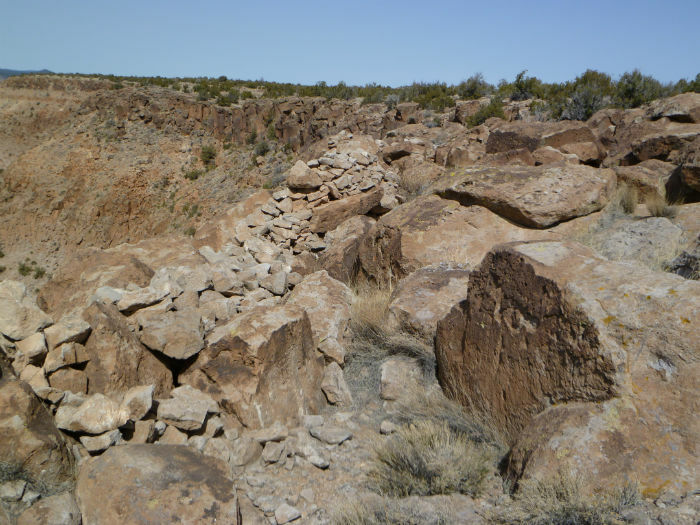 Also at this point we found defensive walls of piled rock. This would have been above the trail we used to access the mesa top, and it was here the Jemez attempted to stop the onslaught from below. The walls appeared crude, but substantial. Moving north on the mesa top, we came upon the main area of dwellings. After having previously seen many good examples of stone pueblo construction, these constructions seemed amazingly crude. 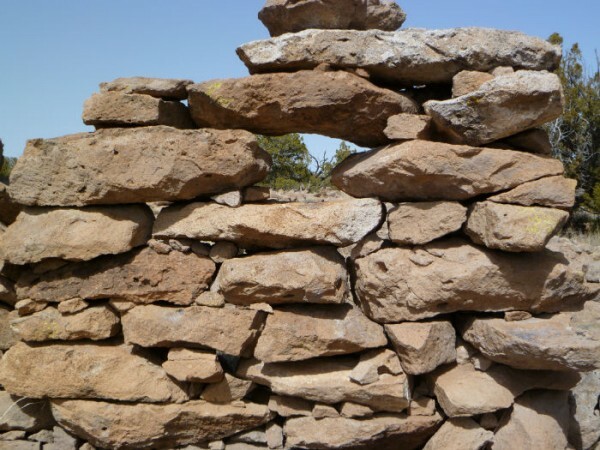 It was obvious they were built in a short period of time with no apparent mortar or stone chinking. Estimates place the total number of rooms at around 250 and were spread over a large area. There weren’t a great number of sherds evident, probably because the length of occupation wasn’t very long. As interesting a site as this was, we were both happy to leave. It was a sad place. Too many breathtakingly bad things had happened here for us to enjoy it in our typical tourist mode. 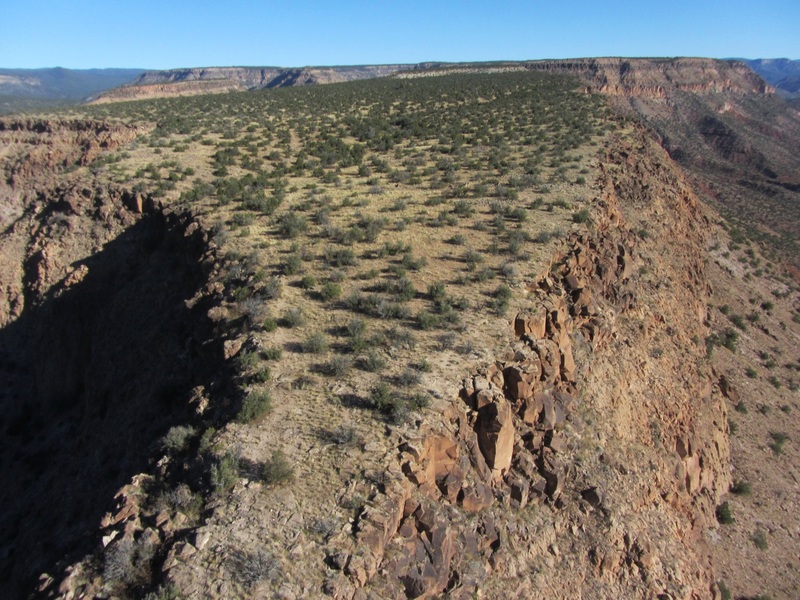 But I gained an enormous respect for the Jemez, holding out against overwhelming odds. It would make a good movie. 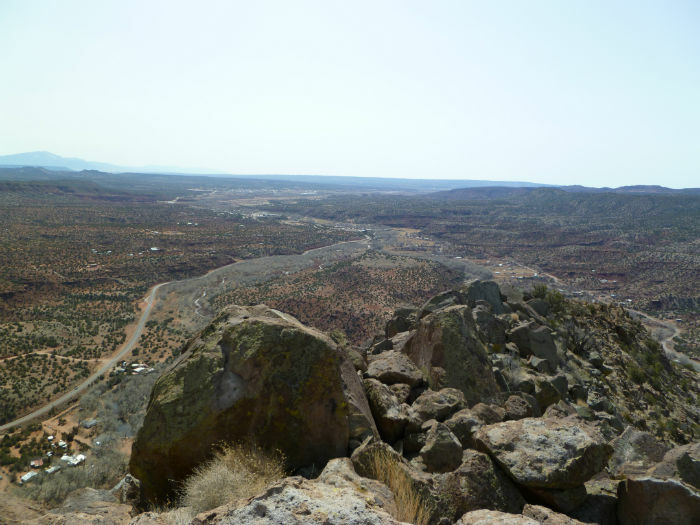 Looking south while hovering just over the nose of Guadalupe Mesa about 1,100′ above and a mile out from the launch site. Imaged on 10/3/2014.